It has often been said that no two engines are exactly alike. In certain respects, this may very well be true, but at Classic Jaguar we none the less approach every engine rebuild in precisely the same way. We consider it an honour to have been entrusted with what is unquestionably the heart and soul of your Jaguar. We are also conscious of the amount of money you are investing in the rebuild. By applying our renowned meticulous standards and vast marque specific experience to your project, you are assured that your TEAM CJ built engine will provide you with many years of faithful service. 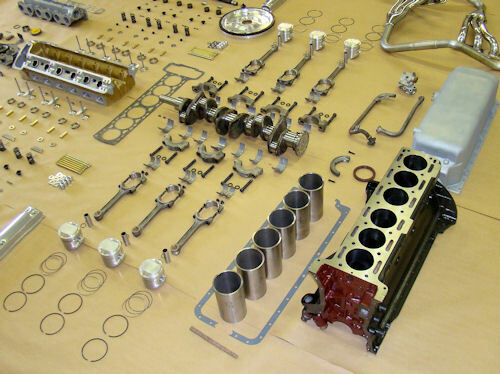 Whether building a stock engine for your concours road car, or a full blown, championship contending race engine, we only have one standard at Classic Jaguar. Our goal is always the same – perfection. All of our engine rebuilds are done to the highest quality standards in the industry. We have no interest in being associated with anything less. From the fabulous quality machine work, and the vast number of components re-used by others that we replace as a matter of course, to the painstaking reassembly process where tolerances are checked and rechecked in our efforts at achieving utter perfection, there is simply nothing to compare with a TEAM CJ engine rebuild. Our reputation in the field is such that we are constantly building engines for Jaguar owners the world over. Our superbly equipped, fully air conditioned engine machine shop and clean room are perfect examples of how seriously we take the task at hand. Nobody enjoys paying the high price of an engine rebuild. When the time comes for you to give your Jaguar engine a new lease of life, make sure you send it to the right place – to Classic Jaguar in Austin, Texas. For your convenience, we will be delighted to send our US mainland customers one of our top quality engine crates that will ensure that your engine is shipped safely and without incident. Classic Jaguar staff will make all the necessary arrangements for convenient door to door collection and delivery. All freight charges are billed at our heavily discounted, high volume rate. Classic Jaguar in the United States and Rob Beere Racing in the United Kingdom have each built enviable worldwide reputations for their work with vintage Jaguars – and E Types in particular. The two companies, almost 5,000 miles apart and separated by the vast Atlantic ocean, could not be closer in terms of their common goals and shared philosophies. That common goal is the relentless persuit of perfection in everything we do, coupled with unparalleled levels of customer service. 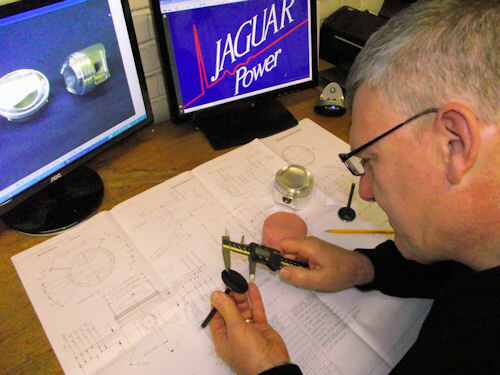 Rob Beere Racing has been at the forefront of Jaguar race engine building in Europe for almost 25 years. The company gained worldwide recognition thanks to their fearsome V12 E Type racer that campaigned with huge success throughout Europe between 1988 and 2001. This incredible E Type recorded more than 50 outright victories, regularly beating Aston Martin Nimrods and Le Mans 220 Jaguars. 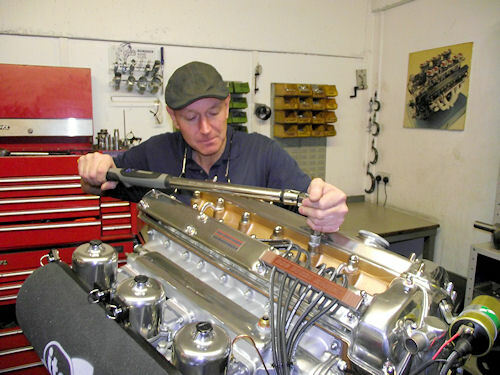 In the new millenium, RBR used lessons learned in competition to develop a wide range of exceptionally engineered performance and reliability upgrades for both racing and road going E Types – as well as continuing to build top quality road and race engines for their extensive European client base. Classic Jaguar and Rob Beere Racing have been doing business together for two decades, each offering superb quality products designed and produced by the other. We are now very proud to announce a collaboration between our two Jaguar engine building programs, with a view to offering the ultimate in extreme high performance street and full race Jaguar engines to discerning clients throughout the American continent. When I saw the superb Team CJ engine machine shop facilities in person, and witnessed the quality of the work in progress, I knew immediately that Classic Jaguar was a company I wanted to work with. TEAM CJ extreme high performance engines are available alongside the established range of stock and Stage One TEAM CJ spec rebuilds. The Supersports 6 spec engine is effectively a race engine for the street. As well as everything included in a Stage One rebuild, the Supersports 6 engines feature various stroked (billet) crankshaft options (up to 5.2 liters), custom forged rods and pistons – and more than 400 ft/lbs of torque available on unleaded pump gas! All TEAM CJ engine and cylinder head rebuild customers are provided with their own webpage on the classicjaguar.com domain where they can follow the progress of their rebuild through to completion. Each customer will also receive a detailed Blue Print covering every aspect of their rebuild. Additionally, our Supersports customers also receive details of all flow bench and dyno testing performed prior to delivery. All TEAM CJ Supersports engines are carefully broken in, tuned and rigorously dyno tested using the actual fuel and ignition systems that will be employed on the finished car. 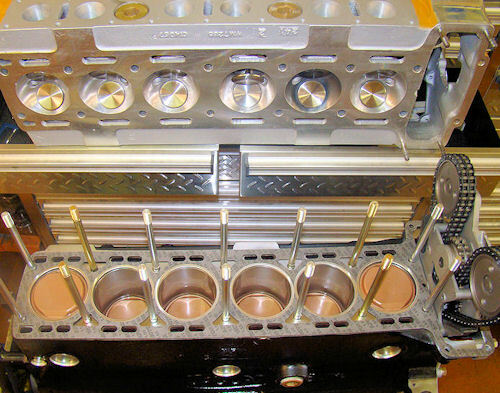 If it is necessary to rebuild carbs (or other ancillary components) in order to test run and tune engines, additional rebuilding charges will apply.